It’s that time of year again. If you or a potential drone fan in your life is looking for a bargain in the run-up to the festive season, it’s worth checking out the Black Friday deals DJI has announced today. The industry’s leading manufacturer is offering a range of discounts on drones, handheld products and FPV goggles. The promotion will go live later this month. When is the DJI Black Friday Sale? DJI’s Black Friday Promotion will be available on DJI’s website and at flagship stores starting November 18th, 12:00 AM (EST) to November 27th, 02:59 AM (EST). There are also additional discounts to be won. Customers can take part in a quiz during the Black Friday Promotional period to win offers and sign up to receive daily coupons during the promotion period. So you’ve got plenty of time to think about what, if anything, you want to get hold of at a discounted price. DJI’s racing goggles are one of the accessories available with a significant discount. 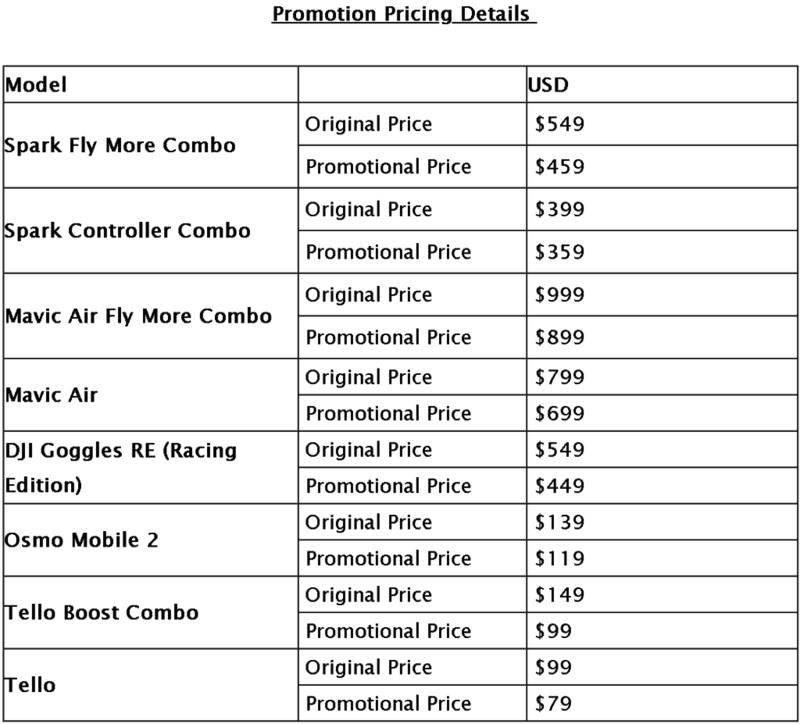 The most notable discounts are across the company’s consumer drone range. The DJI Spark, the Spark Fly More Combo, the Mavic Air, the Mavic Air Fly More Combo, DJI Goggles RE, the Osmo Mobile 2, and the Ryze Tello toy drone and Tello Boost Combo are all being offered with substantial discounts. For those ready to dive into the world of aerial photography and thinking about purchasing a first drone, DJI is offering $100 off the standalone Mavic Air or the Mavic Air Fly More Combo. One step down the ladder of DJI’s consumer drones is the tiny Spark. Pilots looking to add a Spark to their gear set and those new to flying can take advantage of the $40 discount DJI is offering as part of the Black Friday promotion. That’s off the Spark Controller Combo. You can get $90 off the Spark Fly More Combo. Thinking about trying out some non-drone photography gear or other DJI accessories? Keen smartphone photographers can get a discount on the Osmo Mobile 2 handheld gimbal. Pilots who want to try out some FPV flying with their DJI drone can get a huge $100 off DJI Goggles Racing Edition (RE). DJI’s partner Ryze will also be offering the Tello Boost Combo at an exclusive promotional price of $99. That is a bargain. The tiny Tello drone is available for just $99.